For the 1969 season, designer Ron Tauranac laid down a new range of single seater racing cars for the junior formulae. 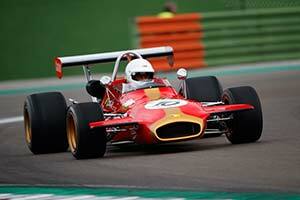 The BT28 was intended for Formula 3, the BT29 aimed at Formula B, while the BT30 was the new Formula 2 car. All three shared the same spaceframe chassis that was more complicated than that of its predecessors. This lead to delays in production with most of the customer cars not ready until the 1970 season. The BT30 F2 car was usually powered by a Ford-Cosworth FVC engine that produced around 220 bhp. This was mated to a Hewland FT 200, five-speed gearbox. Suspension was conventional on all four corners, with out-board mounted brakes. The BT30 featured both front and rear wings. Originally, the F2 racer was fitted with aluminium fuel tanks. A rule change ahead of the 1970 season prompted Brabham to use bag tanks instead. The cars arrived late and the best Brabham driver in the championship was Piers Courage, who finished fifth, with most points scored by the earlier BT23C. In the 1970 season, the best placed Brabham driver was Derek Bell, who was runner up in the BT30 fielded for him by Tom Wheatcroft. In total, Brabham produced 26 BT30s during the 1969 and 1970 seasons. For the the 1971 season, the BT30 evolved into the BT36. It was similar in design but featured in-board rear brakes. The performance was similar to its predecessor and this time, it was Carlos Reutemann who finished runner-up in the championship. Some BT36s were fitted with two-litre engines for the new regulations introduced in 1972. That year, Brabham introduced the all-new BT38, which was designed by Geoff Ferris and featured a monocoque chassis and side-mounted radiators.